TechnoServe is working with chocolate manufacturer CÉMOI to train cocoa cooperatives in the business and management skills they need to produce high-quality cocoa and generate profits for their farmer members. In Côte d'Ivoire, the world’s leading cocoa-producing nation, one quarter of the population – approximately 6 million people – depend on the famous cocoa bean and its resulting value chain for a living. On the production level, the sector is dominated by smallholder farmers. On average, these farmers earn roughly $0.50 a day. In many cocoa-producing nations, cooperatives are a crucial link in the cocoa value chain, bridging the gap between farmers and markets, and often providing the only support services and goods available to farmers in rural areas. By combining members’ limited resources, cooperatives create economies of scale for smallholders, and are recognized as an essential – and one of the only – vehicles for generating higher returns for farmers and alleviating rural poverty. 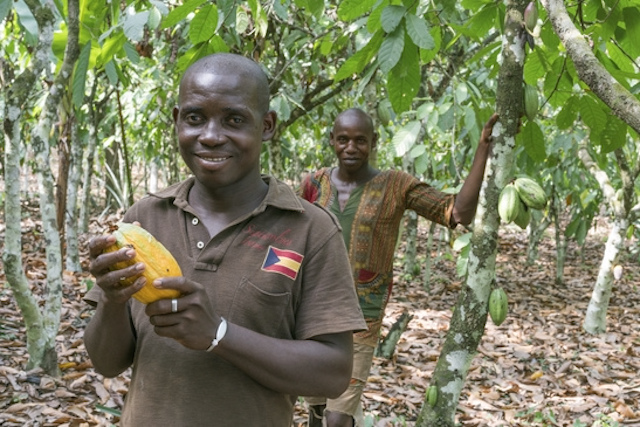 In Côte d'Ivoire, cooperatives provide 20 percent of the cocoa sold in the nation, and generate approximately 6,000 jobs (increasing to 20,000 during the harvest season). However, many barriers prevent cooperatives from meeting their full potential in the fight against rural poverty. In fact, the Ministry of Agriculture has found that 91 percent of the nation’s co-ops fail to conform to good cooperative principles. “Farmers now see our numbers, they have much more confidence, and they sell us all their production." Tricky cash flows (co-ops need to have large amounts of money on hand for harvest season) are often exacerbated by poor governance and leadership, meaning farmers cannot routinely rely on timely payment. 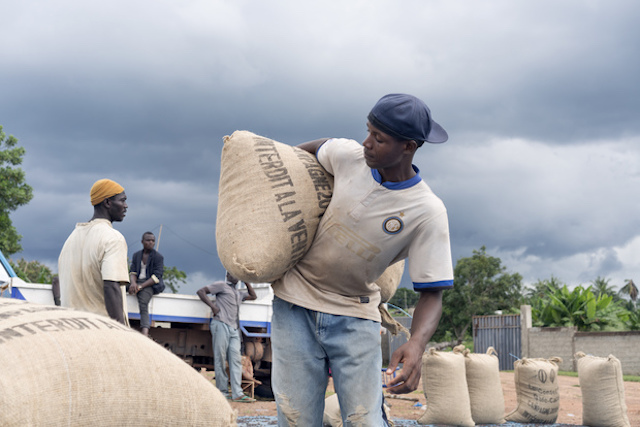 These challenges to financial management are worsened by a general lack of financing options, meaning co-ops struggle to invest in the infrastructure (quality storage, transportation, machinery, processing, and office installations) needed to run an efficient cocoa supply chain and generate high returns for farmers and co-op leaders alike. The result is that relationships between farmers and their cooperatives are often strained, and incomes stagnate across the sector. In order to catalyze change within this inefficient cycle and to strengthen cocoa livelihoods in Côte d'Ivoire, TechnoServe partnered with chocolate manufacturer CÉMOI through the Cocoa Transparency program in 2016. The initiative aims to train cooperatives in the business and management skills they need to generate profits for themselves and their farmer members. By 2019, the program will build the capacity of 16 of CÉMOI’s partner cooperatives to increase the efficiency and transparency of their operations, boosting their value to farmers, and increasing membership for a more resilient and prosperous cocoa sector. 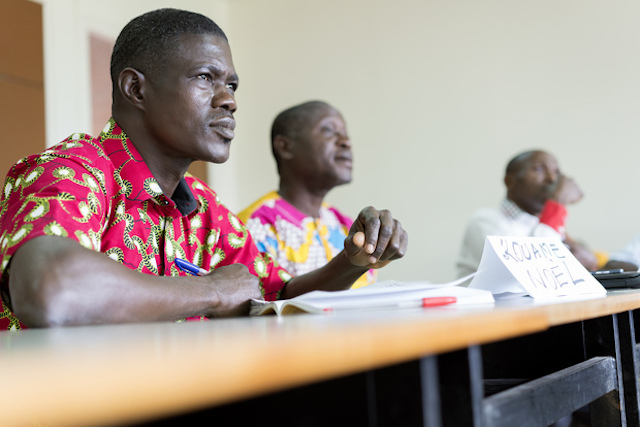 TechnoServe strengthened cooperatives’ roles in Côte d’Ivoire’s cocoa sector by training cooperative employees in best business and operational practices. The first step that TechnoServe took towards strengthening cooperatives was to improve their basic business practices and operations. In Divo, the Scoopakam cooperative had a tense relationship with its members. The cooperative’s leadership was spread thin. Traore Laye, the company’s Chairman, spent his days wearing too many hats, running back and forth between the ovens, the mill, and his office. Without the time or the training to properly organize Scoopakam’s finances, he mixed them together, making them unclear and inefficient for the cooperative, farmers, and buyers alike. After working with TechnoServe for eight months, Traore is proud of the progress the cooperative has made. Working with TechnoServe’s technical advisors, he and other cooperative leadership learned about strategic and administrative management strategies; principles of accounting, financial control, and operational structure; as well as skills for effective leadership and personal development. “We learned a lot about how co-op executives should behave and about good co-op management,” he recalls. After training, Scoopakam leadership decided to hire an accountant and cashier. Traore explains, “Hiring an accountant has helped me tremendously. The sales are more transparent, and I am no longer juggling all of these responsibilities. I now have more time to be at the store, communicating with the producers.” This investment has paid off for Scoopakam and its farmers. "We reduced spending in unnecessary areas and used that money to go towards hiring the new employees,” Traore boasts. In addition to increasing transparency and improving relationships with farmers, improved financial practices that increase capital and reduce costs also allow cooperatives to invest more in the services they provide to their farmer members. Following training for cooperative leadership, TechnoServe helped cooperatives to establish service centers where farmers could not only deliver their harvests, but also receive previously unavailable services, such as loans, health insurance, agricultural inputs, and seedlings, as well as community needs, such as construction and renovation for community buildings. A TechnoServe coach visits these centers twice a month to provide follow-up support for leaders and members. This new level of farmer and community outreach has been beneficial to the producers, who are now able to communicate their needs directly to cooperative employees, who in turn relay them to a steering committee. These decisions had previously been made only by the cooperative president, who often interacted very little with individual farmers. In San Pédro, Konda Abdoudoulaye from the COOPAO cooperative mentions how they have improved their aggregation services for farmers through their work with TechnoServe. While before they only had two collection areas, they’ve now expanded to six, reducing travel time for existing members and opening the door for more farmers to sell their cocoa to the cooperative. TechnoServe’s project teams are already gearing up to further scale the program, and aim to improve the incomes of more than 60,000 people in Côte d’Ivoire’s cocoa value chain by 2020. Read more about TechnoServe’s work in cocoa here.